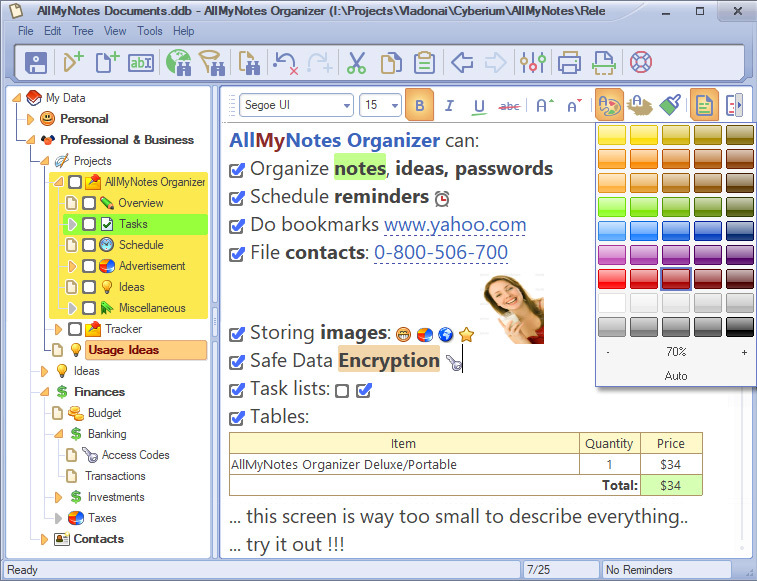 Thanks to All-My-Notes Organizer all your valuable information is stored safely away from other people, locked by password, in a single, encrypted file, and records can be saved into a customizable outline tree structure. Where do you usually keep all your sensible private info, like, access codes, passwords, random ideas, secret docs, reminders, phones and urls. Did you ever found yourself lost in tons of papers, stickers, and random text files? Now, there is an exceptionalsolution! A great outliner for managing any data! It's the best solution of tools for capturing diaries, notes, thoughts, letters, urls, contacts, ideas, quotes, passwords, goals, access keys, and simply unlimited any other things. Major features are: Quick Search across all notes, an Enhanced Editor, safe data storage, data Access Restriction by Password, Password Generator Utility, Icons, Reminders, Tables, Tasks, Scanning, Free-form outline tree structure, Automatic-Backups, Skins, Multilingual, Import and Export. Almost impossible to define all possible usage ways for this kind of app, so ,go ahead, try it, and be sure - anyone can find good use of this kinf of software!